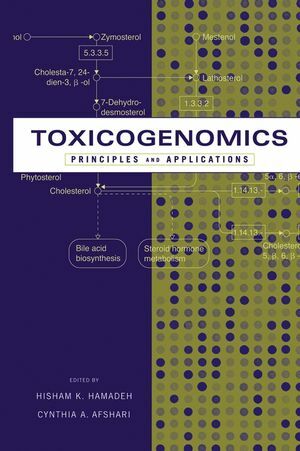 Toxicogenomics: Principles and Applications fills the need for a single, thorough text on the key breakthrough technologies in genomics, proteomics, metabolomics, and bioinformatics, and their applications to toxicology research. The first section following a general introduction is on genomics and toxicogenomics, and qPCR. The next sections are toxicoproteomics and metabolomics. The final section covers bioinformatics aspects, from databases to data integration strategies. A practical resource for specialists and non-specialists alike, this book includes numerous illustrations that support the textual explanations. It offers practical guidance to investigators wishing to pursue this line of research, and lists key relevant software and Internet resources. Dr. Hisham K. Hamadeh is a research scientist at Amgen. He earned his Ph.D. in toxicology from the University of California at Irvine, following up as a research fellow in the National Center for Toxicogenomics Microarray Center, NIEHS. He has received research excellence awards from the Society of Toxicology and American Cancer Society. Dr. Cynthia A. Afshari is Associate Director of Toxicology at Amgen. She has served as Director of Basic Research Applications at the Microarray Center and Head of the Gene Regulation Group, Laboratory of Molecular Carcinogenesis, NIEHS. She has also held a position as adjunct professor for the Curriculum in Toxicology at the University of North Carolina, Chapel Hill. 1. General Toxicology (Ronald C Shank). 2. A Short Introduction to the Expression Profile Toolbox, (Jeffrey F. Waring, et al.). 3. Microarray Manufacture (Emile F Nuwaysir). 4. Scanners (Charles J Tucker). 5. Databases for Toxicogenomics (Pierre R Bushel). 6. Statistics for Toxicogenomics (Thomas J Downey Jr). 7. Real-time and Quantitative PCR (Nigel J Walker and Jeanelle Martinez). 8. Toxicogenomics: Confounding Variables and Data Interpretation (Kevin Morgan, et al.). 9. Introduction ito relationships between toxicology and gene expression (Hisham Hamadeh and Robert Dunn). 10. The Use of a Compendium of Expression Profiles for Mechanism of Toxicity Prediction (Jeffrey F Waring, et al.). 11. Using Genetically-Altered Mice in Toxicogenomics Analysis of Chemical Exposure (J Christopher Corton, et al.). 12. Introduction to High-Throughput Prot ein Expression (Alex Merrick). 13. Analytical Proteomics Approaches To Analysis Of Protein Modifications : Tools For Studying Proteome-Environment Interactions (Daniel Liebler). 14. Introduction to Metabolomics and Metabolic Profiling (Robert London and David Houck). 15. Toxicogenomics Resources (Hisham Hamadeh and Rupesh Amin).